Bake potatoes in preheated oven for 1 hour or microwave for 8-10 minutes until soft. While potatoes are baking, cook the bacon in a large skillet, and caramelize the onion and garlic in a small sautee pan. Crush the oyster crackers in a plastic baggie and set aside. When potatoes are done baking, allow them to cool for 10-15 minutes. Slice potatoes in half lengthwise and scoop the flesh into a large bowl. Place the skin shells on a baking sheet. Mash together the potato flesh, cheese, bacon, kale, caramelized onion, garlic, butter, cream and black pepper. 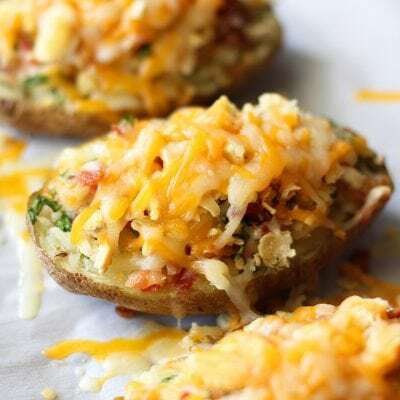 Spoon the filling mixture into the potato skin shells. Top each with the oyster cracker crumble and an additional handful of 4 State Cheddar cheese. Bake for an additional 15 minutes or until cheese is melted and bubbly.